I am the warmest and gooeyest thing your body needs right now. A week til Christmas, everyone! I’m as excited as I should be which is very. How are you guys feeling about Christmas? Are you all humbugged about it? Are you wearing red, green, and white nonstop like I am? I can’t pull off dressing like an elf 11 months of the year so I’m going all out. NO REGRETS! Today’s recipe was inspired by a I think Buzzfeed Tasty video. 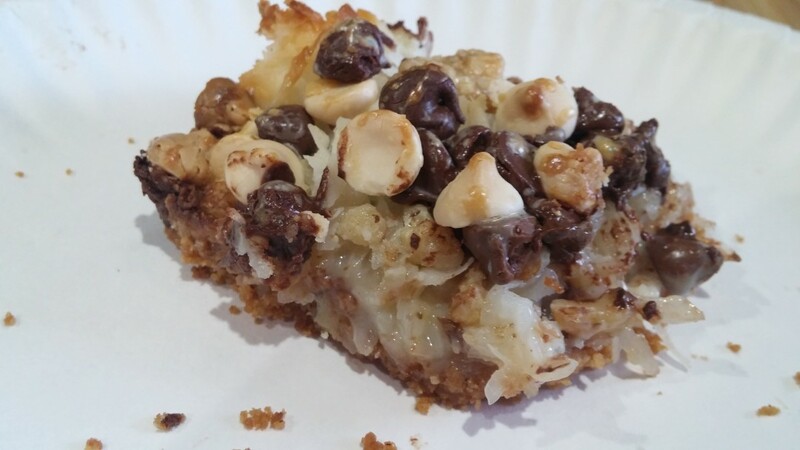 I’ve never heard of Hello Dolly bars but they are everything I want in life and more. I followed the gist of their recipe but kind of did my own thing. I don’t like restrictions. I don’t like rules. Don’t tell me how to live my life, Tasty but also thank you for letting me know about these. Get your Christmas outfit on. I don’t care if it’s Christmas boxers or a Christmas onesie. I want to see you wearing your Christmas spirit. Once you’re done getting all festive, preheat your oven to 350 degrees. If where you live is a little chilly, thank that oven for providing you with some extra Christmas warmth. You go, oven. You are a champion. This recipe is super easy and it doesn’t involve a lot of steps. The hardest bit about this is making the graham crust. 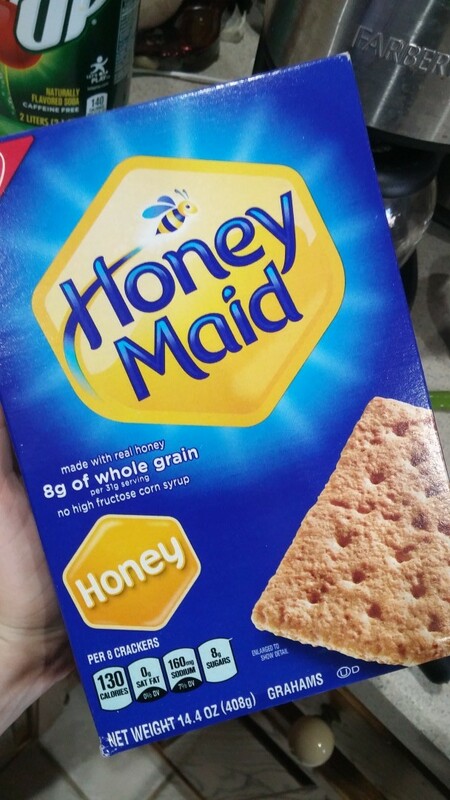 I used half a box of these graham crackers. Crush the graham crackers using your preferred method of choice. I personally like to bludgeon mine to death using a mortar. You can pretty much do whatever you’d like. Now, you can use your graham cracker crust without adding anything to it. I always always add cinnamon. I just enjoy what cinnamon does to the graham crust. Plus, what’s more festive than Cinnamon during the holidays? Nothing. I’m the box that you’ll use only half of. Place your graham crust on the bottom of whatever mold you’ll be using. The crust is the base of this delicious bar so it needs to be on the bottom. Is your graham placed? Is it nice and firm doing it’s graham cracker crust duties? Great! It is time to add all the ingredients! Actually, you want to add the coconut first and layer the coconut all over the place. Make sure every bit has coconut. The coconut is literally the most important part of these bars but don’t let the other ingredients know. They’re all precious. They all worthy but the coconut is what kind of makes it all perfect. Okay! So the coconut is layered and doing it’s thaaang. It’s time to add your chopped walnuts. I had halved walnuts I proceeded to almost pulverize but didn’t. I used my handy dandy mortar! Sprinkle those everywhere! Now, add the chocolates! All of them! Sprinkle them about. Go bananas! Do it while singing your favorite Christmas carol. 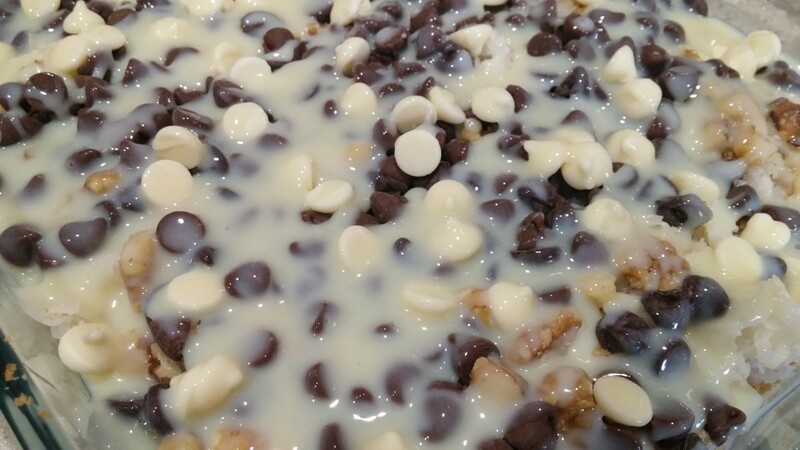 Now that our bars are all spruced up and ready for the oven, you need to add the condensed milk. Don’t just plop it in the middle. You want to pour it all over. Drizzle it about! Make sure you coat all of it. The condensed milk helps everything stick together and if some parts don’t get any, it isn’t going to work. Every bit is covered with condensed milk. This is how you want your life to be. I want to be this bar. It is time to bid your bars a farewell, place them in the oven for 30 minutes and 350 degrees or until the top looks nice and golden. IMPORTANT: Let these sit before you cut into them. They have condensed milk. They have super warm chocolate. It is going to be a hot mess if you try to cut into these freshly out of the oven. Once they’re ready, take them out and let them cool for 10-15 minutes. This is what you get. This is what you will be eating happily while watching some amazing movies. Do it. Do this for you. boo. The Hello Dolly Bars look fantastic! So deliciously gooey! I agree. There’s a lot of anger out there. I’ve never seen so much negativity around this time or honestly, during the rest of the year. I don’t understand why people like to focus on the ugly. The cookies look delicious. They are similar to a recipe that my mother used to make. 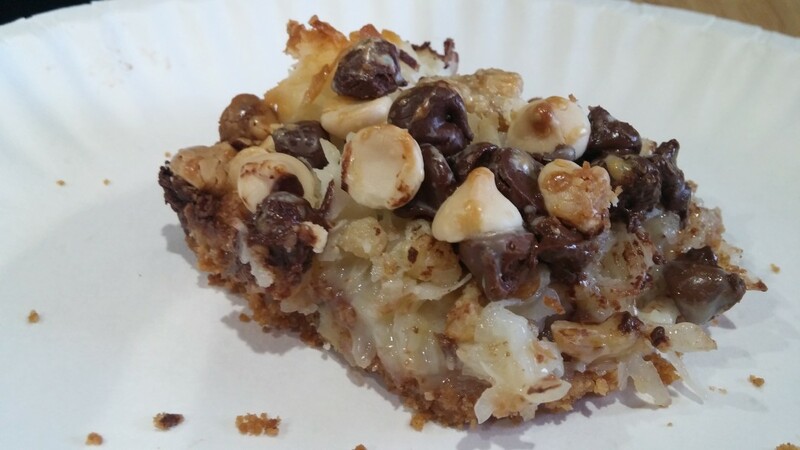 I think they were called Seven Layer Bars. I believe that the recipe was on the inside of the label on the sweetened condensed milk can. I had no idea the labels had recipes. I’m going to have to check them now.